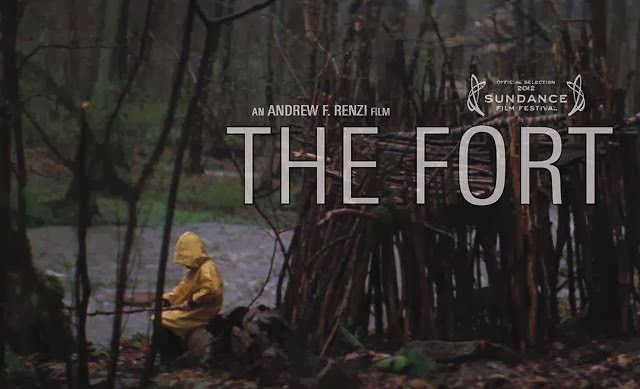 Some ramblings about a Sundance Short film called The Fort. The Fort - Sundance 2012 from Calavera on Vimeo. The suspense/thriller-ish vibe is created by getting the camera to stay just a little too long on each scene. It makes us feel that there must be something significant about it. Which we never find out because we are denied a true conclusion. For such a short movie, the introduction is incredibly long (with the trees etc) which makes me think that they must be significant about the woods and it puts emphasis on how remote and secluded it is, how cut-off from reality. The first camera shot pans down and we can't be sure if it's a point-of-view shot or if it is looking down from above. Then we realize that we are looking down from above and the sight of a small boy alone is much more shocking because we have just seen how far away from anything he is and how quiet and threatening the woods are... We wonder why this little boy is alone and why does he have a knife. He seems vulnerable and in danger. Although nothing has been explicitly shown to make us think 'danger' - the music and subtle hints make us feel uneasy. At first, the adult could be a dad or friendly figure. We do not realize until the boy is inside the 'safety' of the fort, that the man does not know the boy: "what's your name?". The man then takes off the boy's hood and there is a close up of the boy's face - and it is the first close-up that we see in the film (so even more significant). He looks worried and vulnerable and I think the hood-taking-off is symbolic (possibly sexually?) and the discussion of the knife is almost threatening. I think the mud-face-painting is also somehow symbolic. Is he branding the boy as his own? They are both 'dirty' (in both senses of the word?). Or is it some kind of bonding/understanding? He does not speak to his wife about what happened and washes the dirt off his face. It's like a secret. I don't know why the camera paused on the curtain for so long though - it looked like somebody might be behind it? (Is this something more sinister like him keeping dead children in his room?) My main theory was that there was something sinister/sexual in the man's actions towards the boy, but I just read some of the comments under the film clip and 2 interesting suggestions were: the man is the boy's brother, and another was that the man IS the boy. I think both are very plausible. Underneath the video there are several 'theories' about the film, and although i'm not sure I buy the whole story that the person posted about 'the man's brother who died in the river' - there might be something in that idea. There was definitely guilt, and it was significant that he left the boy at the river and was not surprised to find the boy there in the first place either (although he did not know his name so could it really be a brother?). Really beautifully filmed ( I loved the de-saturated tones) and the trees were really graphic. In some ways I don't think we are supposed to know what happened. Maybe that's the beauty of it. That we read so much more into a short and simple scene than we should? Maybe the joke is on us? Whatever it was, it was thought-provoking.